North Tahoe’s Imogen Strydom helps the Lady Lakers to a fourth-place finish as a team. Last week’s storms resulted in tough conditions for high school snowboarders competing in the third round of the California Nevada Interscholastic Ski and Snowboard Federation Central snowboard division at Boreal Mountain California. An icy upper half of the mountain sent many riders sliding past gates on the giant slalom course last Tuesday, but a pair of athletes from Colfax managed to navigate their way cleanly down to sweep first place on the boys and girls’ sides for the second consecutive week. Colfax snowboarder Tyler Suddjian took his second win in a row on the boys’ side, finishing with a combined time of 1 minute, 8.6 seconds. Truckee’s Zac Kuch posted his best finish of the year with a combined time of 1:10.8 for second place. Kuch has finished in the top five in each event this season. 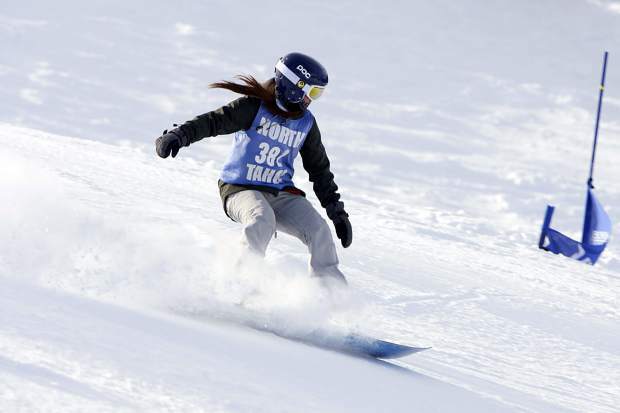 Cali Vail led North Tahoe’s snowboarders with a fourth-place finish. Vail ended his morning with a combined timed of 1:11.5. The Lakers also had Wyatt Johannsson finish 11th with a combined time of 1:19.9. Truckee’s top rider on the year, Caleb Bonneville, posted one of the morning’s fastest runs on the blue course, but a mistake on the red course resulted in a 16th-place finish and a combined time of 1:21.4. Colfax picked up the team win for the third time with 383 points to remain unbeaten on the season. Truckee was fourth with 321 points, followed by North Tahoe in fifth with 320 points. On the girls’ side, Colfax snowboarder Faith Mora won for the second consecutive week, edging out North Tahoe’s Nina Burt by 0.2 with a combined time of 1:14.9. Truckee’s Morgan Just was third with a combined time of 1:18.1. The Lakers’ Paige Battaglia also posted a top-10 finish with a combined time of 1:34.7 for 10th place. Teammates Imogen Strydom (2:08.1.) and Dominque Rios (2:11.1) were 18th and 19th, respectively. Truckee’s Dayna Eder also finished in the top 20, posting a combined time of 2:03.2 for 17th place. The Lady Lakers were defeated as a team for the first time this season as Nevada Union took the win with 365 points, followed by Davis and Colfax with 359 points apiece. North Tahoe was fourth with 355 points, followed by Truckee with 338 points. The next round of racing with be a slalom event at Boreal on Monday, Jan. 28.